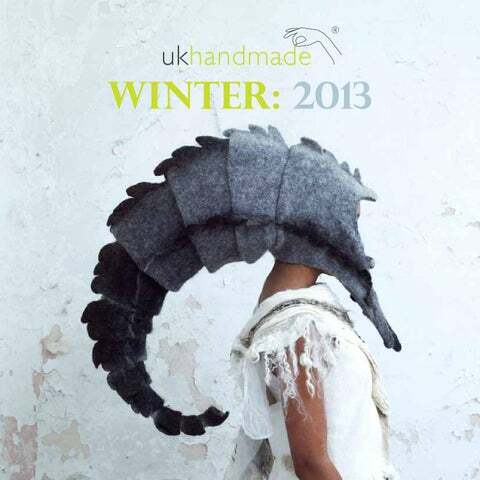 and yours from everyone at UKHandmade. Katrin Moye produces highly decorative and colourful ceramic tableware. Wheel thrown or hand cast in white earthenware clay, decorations are hand-applied with coloured slips and under-glazes, and she employs a variety of techniques including paper cut resists, trailing, sponging and painting. Designed to be used in the everyday domestic setting, she loves the thought that the people who use her tableware wonâ&#x20AC;&#x2122;t feel precious or anxious about handling it. She knows that, with repeated use, a special and intimate relationship can develop between an object and its owner, in a way that never happens with a purely decorative piece. Pattern and colour is pivotal to her work. Katrin focuses on surface decoration, with her designs referencing personal memories, literature, family history and folk art. Influenced by everyday items that featured in her childhood home - the dotty, stripy shirt her father wore, the red Thermos taken on family picnics and the cushion her mother, a textile artist, embroidered for their sofa - some of her patterns are even named after members of her family and the items she associates them with. Your work has a highly distinctive, decorative style. Who or what influences and motivates you? My grandparents in Germany had a beautiful midcentury flat in Wiesbaden, where I spent a lot of time when I was very young. My grandfather had a really good eye for the mid-century style, and the furniture and décor there could now be featured in Elle Deco! I really, really love Scandinavian design from this period, and other influences include folk art from Germany, Northern Europe and the UK. I like to combine these two strong influences with my own observations of patterns found in nature such as leaf and branch shapes on trees, etc. A couple of years ago, I discovered and fell in love with the work of Robert Tavener, a printmaker who lived in my home town of Eastbourne. My interest in him led me to discover other 20th century printmakers and painters, such as Eric Ravilious, John and Paul Nash, and Enid Marx. I felt a special connection to Tavener and Ravilious because the landscapes they depict are so familiar to me, having grown up at the foot of the South Downs. I began reading literature from around this period, particularly books written by women and now being republished by Persephone Books. I’m also a bit obsessed World War 2, but that’s another story! If you had the opportunity to learn or employ a new creative skill, what would it be? Oh god, well, I have bought all the equipment, been on a course at the Curwen print school, had personal tuition from the lovely Sarah Young but I still have not given lino cut printmaking a proper go! One day! What’s next for Katrin Moye? I’m excited at the prospect of making a new body of work that reflects and extends my recent time of research and development, which was funded by the Arts Council. It has been central to a big shift in my attitude and ambitions for my work. I’m planning on making a large piece of work based on the life of my Uncle Werner, who was born in East Germany in 1935 and died last March. It will be a sort of a family biography in ceramic form. And, since I will need to have an income whilst I’m doing this, I have just launched the first patterns in a new collection of bone china mugs that were designed by me and manufactured in Scotland by McLaggan Smith mugs. I’m planning to add to this collection so that there will eventually be a big range of patterns and colours to choose from. information and, with that information tucked away at the back of my brain, I go into the studio and ‘play’! Sometimes an idea will work, other times not - or at least, not quite as I hoped – but, each time I try something, I will analyse it and try to learn from it, bearing in mind the technical information.” • How much time do you have to learn? For example, not only for the course itself, but for any pre-study or homework? • Is the learning somewhere convenient for you and at a time that suits you? After a long day at work, for example, it can be difficult to arrive on a course on time and fully focused, particularly if the course runs for a number of weeks. Finding ways to upgrade your skills As noted, the internet offers an amazing choice. Sites such as www.craftcourses.com have hundreds of courses from which to choose from, and online reviews give you an idea of what to expect. There are relatively new crafts such as up-cycling and metal clay jewellery, and those that rely on tools and techniques that have been in use for centuries, such as bodging and forging. Other useful sources of learning about heritage crafts are the relevant craft guilds and associations. Do you have any formal training? No. When it comes to feltmaking, I’m mostly selftaught. From the start I have learned from books, through trial and error, and working things out on my own. After the birth of my second child, I had a bit of a ‘felt break’ but as he grew older, I was able to continue with my experiments bit by bit. I’ve always known that I wanted to work ‘bigger’, but was content to bide my time and in some ways, I still feel like that now! Being in my own little world like that, the whole vibrant feltmaking scene both in the UK and internationally - bypassed me completely until last year. I’ve since started making up for lost time and have sought out international teachers who have opened up my world. Learning new methods, techniques and adapting them for my own purposes, has deepened my understanding of the technical possibilities tremendously. This in turn has enabled the development of my own work and style. I’ve been fortunate to attend workshops with feltmakers Judit Pócs (Hungary), Vilte Kazlauskaite (Lithuania), Pam de Groot (Australia), Ruth Walker (USA), Chris Lines (UK) and Sheila Smith (UK), amongst others. I am also a member of the International Feltmakers Association and go to as many regional group meetings as possible. It’s incredibly uplifting to spend a day in the company of (mostly) women from all walks of life, united by a shared interest. We make felt together, eat cake, swap tips and techniques and occasionally, benefit from outside tutors coming in too. Who or what inspires your work? Often my starting point is the natural world, although the majority of my current work is informed almost entirely by my subconscious. I think that growing up in a culturally mixed family has had a deep impact on how I see the world (my father is Indonesian and my mother is Dutch). I am instinctively drawn to traditional costume, ritual and theatricality which must have its roots in the images and artefacts that my grandparents exposed me to. At the same time, I grew up with a healthy dose of Northern European practicality, and the work I make is a kind of mix of both influences. To a large extent, the feltmaking process itself also informs my output; it’s such a meditative and transformative process. The end result is not always predictable so it’s worth going into it with an open attitude and seeing what comes out. Often it’s the little ‘mistakes’ that are the most interesting and give rise to new ideas so hopefully, this way my work will continue to evolve and change. eye holes, and achieving facial symmetry. I’ve tried felting around a 3-D resist such as a ball, but it didn’t really work for me with what I was trying to achieve. It is fair to say I’ve had some real disasters, but I see each piece as an opportunity to try out different methods and to learn from the ones that came before. My first experiments with headdresses literally took weeks but now I’ve got it down to about 4 days, depending on complexity. To some people that still may sound like a long time, but the whole process is done entirely by hand and there is no machinery involved. Tell us about your workspace. My workspace consists of my large, second hand dining table, bought for the purpose and situated in my dining room. I would love to have a studio space to call my own one day but, for the time being, I work from home. I have lots of wool and equipment stashed all over the house and in the garden shed. It’s not uncommon for our family meal to be eaten around a work in progress, surrounded by piles of fleece. Luckily, I have a very understanding, supportive partner and children, although they do complain about ‘hairs’ in their dinner from time to time. At the moment, the size of my work is pretty much dictated by the size of my table, which I do find frustrating sometimes as I like to think big. Our second shoot was very laid back, unplanned and kind of evolved as we went. I’m very grateful for Bella’s involvement as it has made me ‘up my game’ in a relatively short time. In terms of attracting interest and commissions, the way your work is presented is not to be underestimated, so good photography is incredibly important. I’m pretty sure a lot of my recent commissions are due to this. All those amazing photos deserved a new website and it just so happened that the friend Bella was with when we first met, was a web designer who has since done a wonderful job on my site. It was definitely a case of being in the right place at the right time! Do you have any new projects coming up? I recently completed a commission for a Mexican commercial, and there’s a possibility they’ll want me to make some more headdresses. There are a few workshops to run until the end of the year and I’ve started thinking about 2014’s workshop programme already (details of new courses will be announced on my website and sent to my e-mailing list). I’ve been invited to guest tutor at various arts centres so I’ll be preparing for those and in Spring 2014, Bella and I are hoping to hold an exhibition of our collaborative work together. I’ve also been approached by a performance arts company about a possible collaboration. I don’t want to say too much about it at this stage as nothing is guaranteed, but I’m really excited about the possibility. Other than that, I have lots of ideas for new work, time permitting. What are your goals for the future? I would really like to collaborate with performance arts and theatre groups as I think my work lends itself well to that. I also have a lot of ideas for installation pieces more suited to gallery settings, so I’m slowly working up the techniques and experience to put something like that together. Somehow I will have to find the time to fit in some extended travel as well. There are two regions I would love to explore. One is Indonesia, for obvious reasons, but also because I think I can find a lot of inspiration there and I’m particularly interested in batik fabrics. The other region is the area known as the Silk Route, stretching from Turkey and Syria in the West, along Iran and Afghanistan and into Mongolia and China in the East. There is a rich and ancient tradition of feltmaking there and I would love to travel along its length, immersing myself in it and learning from the people who have been doing this for millennia. Due to the current political instability in parts of the region, this may have to wait a while. What does handmade mean to you? Genuine handmade means originality, talent, skill and craftsmanship. It means the maker has taken time, care and attention to create the item. Handmade means celebrating slow in an increasingly fast world. It means durability and quality, uniqueness and character. It means saying no to mass produced consumer items. Often, it means a nod to the past and the craftsmen and women that went before; years of collective and personal gathered knowledge, keeping the skills base alive. Sometimes, it means a celebration of very particular and local materials. When you buy handmade, you are buying more than a product. Youâ&#x20AC;&#x2122;re buying a story, a work of art, something that somebody has put their heart into creating. Where can we buy your work? My work is permanently on display in the OWL Gallery (33 Catherine Hill, Frome, Somerset BA11 1BY), along with the work of 5 other local artists: Mel Day (wirework), Steven Jenkins (Pottery & prints), Phaedra Politis (glass work), Anny Colgan (paintings & lino cuts) and Hans Bourgonjon (ceramics). I also sell on-line through Etsy and I welcome enquiries about commissions. For more information on Gladys Paulus, visit: www.gladyspaulus.co.uk Images courtesy of Gladys Paulus and photography by Bella West. is aimed at and how you can converse with them. Usually income, style, age, interests, demographics and ethics are of most interest. Branding works on many levels; it can be eco-friendly, sporty, bohemian, affordable, custom made or quirky, to name but a few. Once you have distinguished who your customer is, you can develop your brand identity around them. Envisage the person buying your products and the keywords that define them. For example, if you make classic, high-end sterling silver jewellery then your brand identity should reflect this. Your customer is likely to be affluent, probably aged 30 upwards and have traditional tastes. There would be no point having a futuristic font because it has no relevance to your core customers unless you are aiming at a niche market. This might sound obvious but you will be surprised at how many people misinterpret their work through bad brand identity and alienate customers. Design Think about what makes the design of your products special or unique and try to make sure that each piece you produce echoes this sentiment. Take wellknown brands within the art & fashion industry e.g. Cath Kidston, Rob Ryan and Emma Bridgewater. What do you think of? The key to a brand identity lies predominately in the product itself. Rather than having lots of unrelated disjointed products, think about developing a range where everything ties in, or separating pieces into collections. You want a customer to recognize your work as unique to you. Think of ways to brand the product itself, a signature pattern, motif, profile, theme or element that ties your work together. Can you put your logo on a small tag if you make jewellery, stamp your ceramics or develop an autograph on your artwork that can become your logo? Fonts and Logos The humble font is an easy and cheap way to create a brand, but beware! The wrong font can sully a customerâ&#x20AC;&#x2122;s first impression while the right one can speak a thousand words! lifestyle your customer can relate to? Are you using a particular style or filter on your images? Try using props to express yourself and watermark your images with your logo so that even when your images are shared, your brand identity and name travels with it. The Internet Social networking sites, blogs, websites and e-commerce should link together to create continuity across all your online platforms. Customize these as much as you can too by adding your logo and supporting images. If you can create personalized buttons, use this feature. When describing your company in the ‘About’ section, tell your customer who the product is aimed at and why so that they can relate. Other Elements to Consider Taglines are short snappy phrases that sum up your brand and can be a catchy way to help people remember you. Colour can also be a powerful reminder; take the popular brand Tiffany who use an iconic blue. How your product is received and defined can be encapsulated by, for example, your personal style via a blog, your values or principles set out as a brand goal or how you define customer service. And Finally ... Branding can be applied across all platforms of your business. The important thing to consider is continuity throughout, because there’s no point branding one aspect whilst neglecting others. If your customer picks up a newly designed business card and then approaches your out-of-date website to be greeted with a completely different brand identity, they may think they have come to the wrong site! Brand identity isn’t scary or complicated, it’s a way of professionally articulating and translating the style of your work through subtle methods, and generating customers who will appreciate, value and connect with your business. Can you tell us a bit about your creative work space and studio? I have a space at Cockpit Arts in Holborn, London, where I have worked for longer than I care to remember. I enjoy having my own space, but in a community of other makers, designers and artists in a fascinating area. Itâ&#x20AC;&#x2122;s a ten minute walk from Hatton Garden or the British Museum, but is somehow still off the beaten track. My studio has been described as â&#x20AC;&#x2DC;elegantly clutteredâ&#x20AC;&#x2122;. It is certainly full of stuff; tools, materials, catalogues, bits of things which might come in useful or which capture something which interests me, or test pieces and bits of jewellery that went wrong in an interesting way. What do you love most about what you do, and what do you find the most frustrating? I love that sense of being in the zone, at my bench, lost in time, absorbed in making and thinking out something new. The frustrating thing is that this most valuable of experiences becomes overridden by the day to day round of emails, paperwork and other necessary distractions. anymore - or it stops interesting you like it used to be willing to move on to the next thing. What are your main goals for the next year? Well, my partner and I have bought a house which is a real project (in that it needs everything done to it), and we are just emerging from the labyrinth of planning conditions and consents. It’s a lovely Victorian stonemason’s house and there is space there to build me a new studio, so I am hoping to spend some time working on making our plans a reality. You exhibit internationally, take part in major contemporary events, and your work is in museum collections and galleries across the UK and beyond. What would you say has been the highlight of your career so far? I’ve been very lucky and there have been a lot of highlights. It’s really good to have things in museums and collections; it’s affirming and ensures one’s immortality. There was an amazing lecture tour of India in 1990 when, as a guest of the British Council, I was able to meet and get to know craftspeople and artists from all over the country and all walks of life, and there has since been inspiring teaching trips to Japan, Portugal, Taiwan and the USA. Where do you get your inspiration from when you are initially designing your products? Our inspiration comes from our everyday life, travel and interests, and we try to find our own path. We do not follow trends. Our aim is to create things that excite us and that we have never seen before. Our interests and styles change and evolve over time but, at the moment, we are embracing our common love for renaissance art and weâ&#x20AC;&#x2122;re having a lot of fun with it. We always try to add a twist of something unexpected or poetic to our designs. As part of the creative process, you collaborate with makers to realise your products. How important is it that they are UK based? It is very important that our products are all made in the UK. Apart from the fact that it is nice to support UK industry and be able to easily talk or meet the people who are making items for us, UK manufacturing gives us a few other great advantages including low minimum orders and fast development time. Producing in the UK does cost a lot more that in many other countries but, the advantages it gives in other ways, is worth it for us. The UK has lost a lot of its manufacturing over the past decade or so, but Iâ&#x20AC;&#x2122;m glad we have proved that it is still possible! Knitwear Design by Lisa Margreet Payne I had high hopes for Knitwear Design, looking to expand on my knowledge of designing knitting patterns and learn some new techniques. Having written a few knitting and crochet patterns with no formal training to speak of, I was hoping to pick up some tips and perhaps learn the “proper” way of doing it. Knitwear Design is a very professional book aimed, according to the blurb, at being a “practical guide to the dynamic revival of contemporary knitting” and “a source of inspiration and advice on the latest techniques and practices”. It sounded like it would be right up my street. This page: Red and white striped expressionist knit dress, using industrial barrier tape by Craig Lawrence, Spring/Summer 2010 collection (page 136). Opposite: â&#x20AC;&#x2DC;Knit Knot Treeâ&#x20AC;&#x2122;, Yellow Springs, Ohio; yarn-bombed tree by Jafagirls (page 9). Knit instillation ‘Anyway’, 2002, by textile artist Freddie Robins. A series of large-scale, tubular, ‘interconnected four-limbed sweaters’ exploring seamless knitting technology (page 20). This simple recipe uses measuring cups and is perfect for keeping little hands busy on cold, wintery days. The sugar-coated, bite size snowballs make gorgeous gifts for Christmas and a lovely â&#x20AC;&#x2DC;take alongâ&#x20AC;&#x2122; for Christmas parties. METHOD: 1. Grease and line a large baking sheet, and preheat the oven to 350째f/180째c/gas 4. Taking approximately 1 tablespoon of mix, gently squeeze and roll into a ball. Place on the prepared baking sheet and repeat with the remaining mixture. 6. Bake on the middle shelf for 16-18 minutes or until golden brown. 7. Remove the cookies from the oven. Allow them to cool for a few minutes, and then roll them in the extra icing sugar. Set aside to cool completely. 8. When they have completely cooled, gently press and roll the cookies in the remaining icing sugar again so that they are fully coated. 9. Store in an air tight container and enjoy with a nice cup of tea; or present in a pretty glass jar, tied with ribbon and labelled. Images courtesy of Larissa Joice. 4. Place your ruler along this line and mark a point 2cm from the top and again at 12cm; this marks the height of the triangle that will form the shape of your tree. Draw a 8cm horizontal line across the bottom point, then join the ends of this line to the top point to make the triangle. 5. On the central line of the triangle, mark a point at each centimetre, then draw horizontal lines to the edge of the triangle to form the branches of your tree. 6. This is the tricky part, cutting out the tree. You need to start at the top point of the triangle and cut down one side as far as the first line, turn the card round and cut along the first branch to the other end and stop. eaten straight from the field, and tomatoes eaten from the vine, wrapped in basil leaves picked from the plant below. It was luxurious to have so much natural abundance. But now the wind has picked up, rain is blowing in and winter proper will be here before we know it. I’ve put the garden to sleep, some of it mulched under cardboard to smother weeds and feed the soil, and I’ve fed other parts of the ground with a “green manure”, a crop planted to restore nutrients to the soil. The outside areas of the moveable greenhouses are planted with crops for winter and next spring, and I’m already planning for next year. A culinary and medicinal herb garden is going to be a new part of the garden design. Being able to provide a wide range of crops - even at my beginner stage - shows that it can be done. I like knowing how to do things myself in the same way that I like to knit my own jumpers and sew my own clothes. Rather than just being a passive consumer, I can now grow my own food! It’s empowering, liberating and, most importantly, it’s attainable. However, the continental Robin is much more shy and retiring than our native Robin. Native Robins have benefited hugely from the UK’s long standing interest in gardening and they will often perch on the handles of garden tools, swooping on insects and worms as we dig. 1. Break the chocolate into a large, clean bowl. In a small pan, bring the cream to the boil and pour immediately over the chocolate. 2. Stir well, until the mixture is smooth and the chocolate has melted. Allow the mixture to cool completely and then chill until set. 3. When the mixture has set, use a teaspoon to scoop out small pieces. Dust your hands with cocoa or icing sugar, roll the pieces into balls and toss the balls in the sifted cocoa powder or icing sugar. Place on the prepared baking tray and chill. Stored in an airtight container in the fridge, these truffles should keep for up to a week. Dust with extra cocoa (or icing sugar for white chocolate truffles) before serving or presenting as a gift. 1. Place the sugar and the water in a large, heavy based pan over a low heat; the sugar needs to dissolve slowly so do not stir. 2. When the sugar has dissolved completely, add the coconut milk and bring to the boil. Boil for approximately 10 minutes or until the mixture reaches the â&#x20AC;&#x2DC;soft ballâ&#x20AC;&#x2122; stage (where a small amount dropped into a cup of cold water forms a soft, malleable ball). 3. Remove the pan from the heat, set aside for a couple minutes and then stir in the vanilla extract and desiccated coconut. The mixture will start to thicken so quickly pour into the prepared tin. 4. Leave at room temperature until the coconut ice has cooled and is firm. Turn out onto a clean surface and cut into cubes. Store in an airtight container in a cool place till required. Hokey Pokey Otherwise known as Honeycomb, this version is dipped in dark chocolate for an extra special treat. Ingredients: 3 tablespoons of clear honey 5 tablespoons of granulated or caster sugar 4 tablespoons water 15g butter 1 teaspoon cider vinegar 1 teaspoon bicarbonate of soda 150g of good quality, dark chocolate You will also need a lightly oiled, deep baking tin and a baking tray lined with greaseproof paper. 1. Place the honey, sugar, water, butter and vinegar in a large, heavy based saucepan. Heat slowly and stir until the sugar has dissolved and the butter has melted. 2. Bring to the boil, cover the pan and boil gently for 2 minutes. Uncover and continue to boil, without stirring, for approximately 15 minutes or until the mixture reaches the hard crack stage (where a small amount dropped into a glass of cold water becomes hard and brittle). stir in the bicarbonate of soda. The mixture will immediately expand and rise in the pan. Pour into the tin to cool and then break into large shards. 1. Place the canes in a small plastic bag and using the end of a rolling pin, crush and break into small chunks or fragments. 1. Very carefully insert the lolly sticks into the cream centre of the cookies and set aside. Place the canes in a small plastic bag and, using the end of a rolling pin, crush and break into small fragments. 2. Gently melt the chocolate in a bowl set over a pan of simmering water (or use a double boiler or microwave). 3. This is the fiddly bit. Carefully spoon the melted chocolate over the cookies, making sure that they are well coated and that the stick is sealed in place. Place on the prepared baking tray, sprinkle with the candy cane and chill till set. Store in an airtight container in a cool place till required. SCENE: Winter Events For Your Diary An abundance of wonderful handmade events will be taking place this winter around the UK. Here’s a taster selection of events to help get you started. 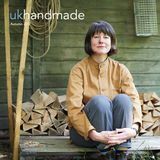 Buy handmade this Christmas! Handmade Christmas Date: 13th, 14th & 15th December Time: 1pm-8.30pm (opens 12.00 on Saturday) Venue: The O2, Peninsula Square, London SE10 0DX Entry: ÂŁ6.50 Hundreds of the UKâ&#x20AC;&#x2122;s best designers, crafters and food merchants will be showcasing their talents at the O2 this Christmas, during this three day event that is sure to become a regular on the crafting calendar. Avoid the hegemony of the high street; find original and beautiful handmade gifts and seasonal home-grown food and drink this Christmas. Besides one-of-a-kind gifts, there will be workshops and demonstrations too. Easily accessible by road and the underground. Just in time for Christmas, you’ll find unique and beautiful jewellery, textiles, glass, ceramics and furniture, and there’ll be something for everyone’s tastes and budget. There is a private view on Thursday evening but some tickets are available to the public, a great chance to get your hands on some fabulous gifts before it is opened up to everyone else! For more information, visit: www.brighton-made.co.uk Makers Boutique Date: 1st November-21st December Time: 12-5pm Friday, 10am-5.pm Saturday & 10am5pm Sunday Venue: Fishing Quarter Gallery, Kings Rod Arches, Brighton Seafront, BN1 1NB Entry: FREE Makers Boutique are back for their 6th exhibition at Brighton Fishing Quarter, with a fabulous selection of handmade contemporary arts and crafts by local artists at this popular seafront destination. This carefully curated exhibition showcases only the very best of Sussex creative talent. your dog! With 19 different artists exhibiting, you are sure to find the perfect handmade present. A card machine is available and well behaved dogs are welcome on leads. unique pieces of jewellery, textiles, ceramics, glass, wood and metalwork. It is also the perfect buying opportunity for festive shoppers and finding something really special for the people you love.